The future of food may depend on an unlikely marriage: organic farmers and genetic engineering. BEGINNING IN 1997, an important change swept over cotton farms in northern China. By adopting new farming techniques, growers found they could spray far less insecticide over their fields. Within four years they had reduced their annual use of the poisonous chemicals by 156 million pounds - almost as much as is used in the entire state of California each year. Cotton yields in the region climbed, and production costs fell. Strikingly, the number of insecticide-related illnesses among farmers in the region dropped to a quarter of their previous level. This story, which has been repeated around the world, is precisely the kind of triumph over chemicals that organic-farming advocates wish for. But the hero in this story isn't organic farming. It is genetic engineering. The most important change embraced by the Chinese farmers was to use a variety of cotton genetically engineered to protect itself against insects. The plants carry a protein called Bt, a favorite insecticide of organic farmers because it kills pests but is nontoxic to mammals, birds, fish, and humans. By 2001, Bt cotton accounted for nearly half the cotton produced in China. For anyone worried about the future of global agriculture, the story is instructive. The world faces an enormous challenge: Its growing population demands more food and other crops, but standard commercial agriculture uses industrial quantities of pesticides and harms the environment in other ways. The organic farming movement has shown that it is possible to dramatically reduce the use of insecticides, and that doing so benefits both farm workers and the environment. But organic farming also has serious limits - there are many pests and diseases that cannot be controlled using organic approaches, and organic crops are generally more expensive to produce and buy. To meet the appetites of the world's population without drastically hurting the environment requires a visionary new approach: combining genetic engineering and organic farming. This idea is anathema to many people, especially the advocates who have helped build organic farming into a major industry in richer countries. As reflected by statements on their websites, it is clear that most organic farming trade organizations are deeply, viscerally opposed to genetically engineered crops and seeds. Virtually all endorse the National Organic Standards Board's recommendation that genetic engineering be prohibited in organic production. But ultimately, this resistance hurts farmers, consumers, and the planet. Without the use of genetically engineered seed, the beneficial effects of organic farming - a thoughtful, ecologically minded approach to growing food - will likely remain small. Despite tremendous growth in the last 15 years, organic farms still produce just a tiny fraction of our food; they account for less than 3 percent of all US agriculture and even less worldwide. In contrast, in the same period, the use of genetically engineered crops has increased to the point where they represent 50 to 90 percent of the acreage where they are available. These include insect-resistant varieties of cotton and corn; herbicide-tolerant soybean, corn, and canola; and virus-resistant papaya. After more than a decade of genetically engineered crops, and more than 30 years of organic farming, we know that neither method alone is sufficient to solve the problems faced - and caused - by agriculture. It is time to abandon the caricatures of genetic engineering that are popular among some consumers and activists, and instead see it for what it is: A tool that can help the ecological farming revolution grow into a lasting movement with global impact. By 2050, the number of people on earth is expected to increase from the current 6.7 billion to 9.2 billion. To feed those people with current crop yields and farming practices, we will need to clear, fertilize, and spray vast amounts of wild land. Millions of birds and billions of beneficial insects will die from lost habitat and industrial pesticides, farm workers will be at increased risk for disease, and the public will lose billions of dollars as a consequence of environmental degradation. Clearly, there must be a better way to boost food production while minimizing its impact. An alternative is to expand the number of organic farms, which do not use synthetic pesticides and thus support higher levels of biodiversity than conventional farms. Some organic farmers even retain patches of natural habitat on farms to provide shelter for wildlife. But at current crop yields, farming will still need to absorb huge amounts of additional land that is now home to wildlife and diverse ecosystems. A clear challenge for the next century is to develop more productive crops, not just better farming techniques, and genetic engineering has demonstrated great promise here. One way to boost yields is to develop crops that can survive harsh conditions such as drought, cold, heat, salt, and flooding. Many of the world's poorest people farm in areas that are far from ideal, and freshwater sources are decreasing in quantity and quality throughout the world. Organic farming can help somewhat: Organically cultivated soil tends to hold water longer because of the higher levels of organic matter. Still this approach has limits. Far more helpful would be new crop varieties designed to survive in difficult environments, and in the future this is where genetic engineering will likely have the most significant human and ecological impact. Crops with enhanced tolerance to drought, for instance, would allow farmers to produce more food using less water. Already there are varieties of genetically engineered wheat that can tolerate drought, as well as rice that can tolerate flooding and tomato plants that can tolerate salt. Another important challenge is to fight pests and disease, which take an estimated 20 to 40 percent bite out of agricultural productivity worldwide. Reducing this loss would be equivalent to creating more land and more water. But current pesticide use is a health and environmental hazard, and organic and genetic engineering offer complementary solutions. Genetic engineering can be used to develop seeds with enhanced resistance to pests and pathogens; organic farming can manage the overall spectrum of pests more effectively. Genetically engineered crops have already enjoyed major success against pests. For example, on farm field trials carried out in central and southern India, where small-scale farmers typically suffer large losses because of pests, average yields of genetically engineered crops exceeded those of conventional crops by 80 percent. In Hawaii, the 1998 introduction of an engineered papaya plant that could resist the papaya ringspot virus virtually saved the industry. There was no organic approach available then to protect the papaya from this devastating disease, nor is there now. When engineering hits its limits, though, organic farming can help. For example, the Bt cotton that transformed Chinese farming only kills caterpillars of some species, so it cannot be a stand-alone solution for general insect control. In fact, after seven years of pesticide reductions in Bt cotton fields in China, populations of other insects increased so much that farmers had to resume spraying certain insecticides. Organic farmers, by contrast, control these secondary pests by introducing beneficial insects that feed on the pests and by rotating crops to reduce the overall pest populations. Genetic engineering also helps achieve other goals of the organic farming movement. By reducing the use of pesticides and by reducing pests and disease, it can make farming more affordable and thus keep family farmers in business and assure local food security. It can also make food more nutritious: In 2011, plant breeders expect to release "golden rice," a genetically engineered variety that will help fight Vitamin A deficiency in the developing world, a disease that contributes to the deaths of 8 million young children each year. To successfully blend the two important strands of modern agriculture - genetic engineering and organic farming - we will need to overcome long animosity between the advocates of organic farming and conventional farmers. 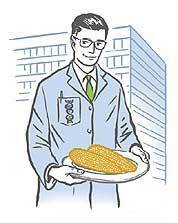 We also need to address the repulsion many consumers feel toward the idea of genetic engineering. To many supporters of organic agriculture, genetically altering crops feels fundamentally wrong or unnatural. They believe that farmers already have enough tools for a productive and healthy farming system. On an environmental level, many worry that genetically engineered crops will cross-pollinate nearby species to create a new kind of weed that could invade pristine ecosystems and destroy native plant populations. On a personal level, many consumers worry that genetically engineered foods are unsafe or unhealthy to eat. So far, however, it appears those concerns are driven more by technological anxiety than by science. Virtually all scientific panels that have studied this matter have concluded that pollen drift from genetically engineered varieties currently grown in the United States does not pose a risk of invasiveness. (Although this does not mean that future crop varieties will also be harmless: each new crop variety must be considered on a case-by-case basis.) And in terms of food safety, a report by the National Academy of Sciences concluded that the process of adding genes to our food by genetic engineering is no riskier than mixing genes by conventional plant breeding. Today 70 percent of all processed foods in the United States have at least one ingredient from genetically engineered corn, cotton, canola, or soybean. Unlike the well-documented adverse effects of some pesticides, there has not been a single case of illness associated with these crops. Many opponents of genetic engineering fear that a blizzard of patents on genetically engineered plants and seeds will put control of agriculture in the hands of a few giant companies that produce the seeds. Yet there are many new and imaginative methods that businesses and universities are now using to ensure that breakthroughs and useful technologies benefit less developed countries and small-acreage farmers. For example, the nonprofit initiative Public Intellectual Property Resource for Agriculture brings together intellectual property from more than 40 universities, public agencies, and nonprofit institutes and makes these technologies available to developing countries around the world for humanitarian purposes. Pitting genetic engineering and organic farming against each other only prevents the transformative changes needed on our farms. There seems to be a communication gap between organic and conventional farmers and between consumers and scientists. The stakes are high in closing that gap. Without good science and good farming, we cannot even begin to dream about establishing an ecologically balanced, biologically based system of farming and ensuring food security. It seems nearly inevitable that genetic engineering will play an increasingly important role in agriculture. The question is not whether we should use genetic engineering, but more pressingly, how we should use it - to what responsible purpose. Agriculture needs our collective help and all appropriate tools if we are to feed the growing population in an ecological manner. Consumers have a significant opportunity to influence what kinds of plants are developed and to address the key agricultural challenges. Let us direct attention to where it matters - the need to support the use of seed and farming methods that are good for the environment and for the consumers. What we can hope for is a future in which farmers use the best organic farming methods to grow the most beneficial engineered crops. Any effective approach in feeding the world in a sustainable manner will require us to embrace more than one great new idea. Pamela Ronald is a professor of plant pathology at the University of California, Davis, and co-author with her husband, an organic farmer, of "Tomorrow's Table: Organic Farming, Genetics, and the Future of Food."